The calendars on our website contain identical information as the DynaCal calendars, so if you prefer the old format, you can view the events on DynaCal. This view is a standard monthly "wall calendar" grid. In situations where the grid view will not fit within the web page layout, it will pop up into a new window for viewing. List viewThis view displays events in a list format for the selected period of days. 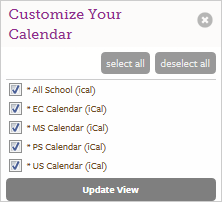 Sign up to receive alerts for specific calendars. See full instructions here. Search the selected calendar for events that match one or more keywords. Located in the left column. Set up an iCal feed to Google calendar, Outlook, and others, or export events to MS Excel format. Calendar Help This icon links to a universal document that is generic to all schools using the calendar system. The Help document you are reading now is specific to HB's site.